The Grays Harbor Genealogical Society is rising from the ashes after the total loss of their research library in a raging fire on June 9, 2018. The 3-alarm fire at the Aberdeen Armory also destroyed most of the Aberdeen Museum of History, Coastal Community Action and Aberdeen Senior Center. Occupants are still unable to get inside the building according to the Daily World newspaper update on July 27, 2018. In the meantime, GHGS is moving ahead, thanks in large part to the generosity of many individuals, organizations and genealogical societies. The Hoquiam Library has offered a temporary space to set up shop. With funds collected from the Go Fund Me campaign and donations directly to GHGS, a copy machine and computer have been purchased and installed. Members are hoping to purchase a second computer, printer, office furniture and office supplies soon. Two fundraising events benefiting the society have been organized. 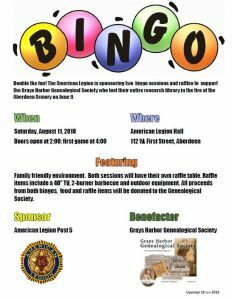 The American Legion Post 5 (Aberdeen) is sponsoring two bingo sessions and a raffle on Saturday, August 11. 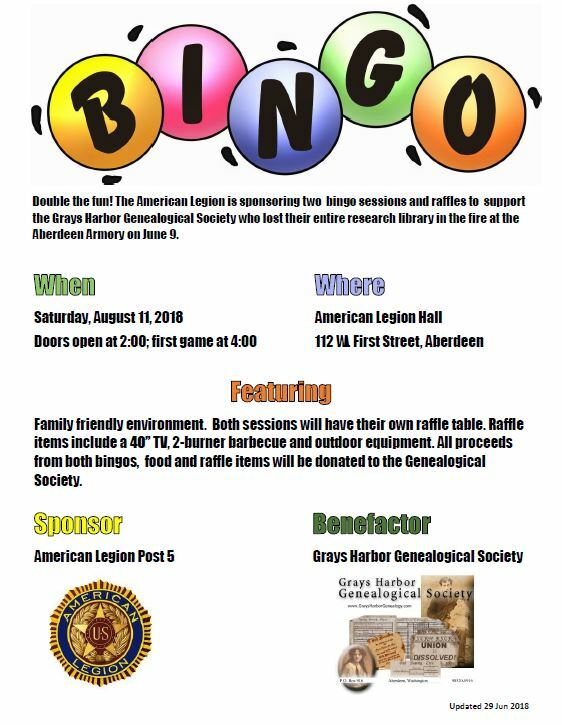 All proceeds from the bingo sessions, food and raffle will go directly to GHGS. A second fundraiser will be a workshop with Portland-area genealogist Pam Vestal on Saturday, October 13. Ms. Vestal reached out and generously offered to donate her time and talent at a three-session workshop. More information will be forthcoming. For more information about the Grays Harbor Genealogical Society, the fire or the research library, contact GHGS President Gary Parfitt. This entry was posted in Society News and tagged Grays Harbor Genealogical Society.